Firefly Mobile has tons of new devices on its roster, most of them did not experienced proper introduction, just like the Aurii Vivid, which is already the fourth item on the list. 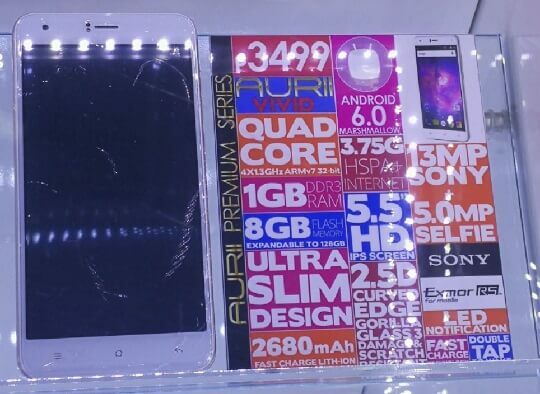 The Firefly Mobile Aurii Vivid is another entry-level offering, it sports a 5.5-inch HD display with IPS technology for better viewing angles, and topped with Corning Gorilla Glass 3 for protection against the usual scratches. Underneath its skin is a 1.3GHz quad core processor paired with 1GB of RAM and 8GB of flash memory. Meanwhile, the camera department employs a 13MP Sony Exmor RS sensor for its main gunner, most probably an interpolated from 8MP (same as the Aurii Secret X), while a 5MP front snapper takes care of selfies or groupies. Other known specs include dual SIM with HSPA+ connectivity, fast charging 2680mAh battery, LED notification light, and runs on Android Marshmallow. It retails for Php3,499 with free tempered glass and armor case.